2014 was the year that #MapLesotho was born. I’m not even sure who deserves credit for first coining the phrase “MapLesotho”, which should immediately add to the mystique. It could simply be that we just copied the @MapKibera project that was devised by the brilliant Mikel Maron as he added a previously un-mapped slum of Nairobi to the world of openstreetmap. There are a few more…. “nefarious” versions of events, with an overly tired Joe Corr trying to make sense of his mission to Lesotho in Oliver Tambo connection lounge. Whatever the origin, within the name is the call to action, the verb and the setting. The openstreetmap, hotosm and missingmaps projects/communities get the idea instantly. Others who are less versed in digital mapping first ask why it isn’t already mapped, followed by wanting to know the reasons why it should be mapped in the first place. In fairness it takes a short conversation before everyone is on board conceptually and wants to help out. There were lots of versions of this conversation over the year, my own favourite with Pete Masters when we discussed how lack of Planning regulation can mean no sewers in new housing developments, no sewers means polluted groundwater and poor environmental quality and it is then no surprise that water-born disease rates are of great concern. These diseases particularly affect children, who drink this water and play in this environment. 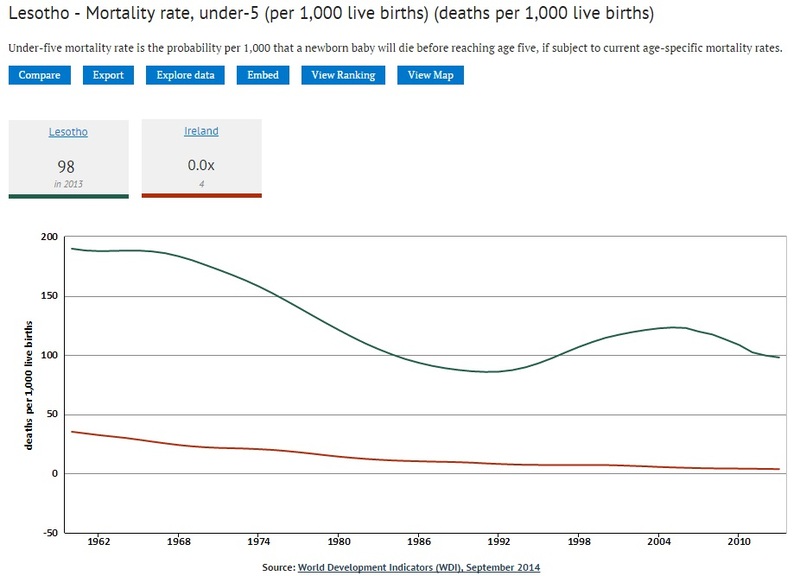 We are chastened by the fact that the basic child mortality rate in Lesotho is 26 times that of Ireland. Will #MapLesotho help any of this? The answer is that it can: especially if it helps decision makers to understand the scale and location of where building demand is taking place. That in turn allows demand for residential land to be better managed and infrastructure to be more carefully sequenced. It doesn’t always go wrong in Lesotho, the problem is that it needs to go right more often than it has been doing up to now. We did hear from one set of end-user in this blogpost. 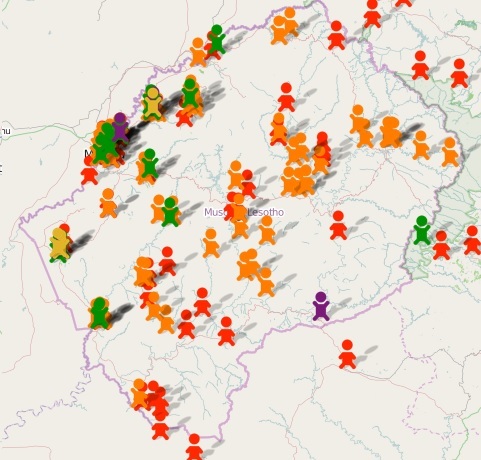 The story of #MapLesotho in 2014 wouldn’t be worth telling without making reference to the crowdsourcing that has been taking place to fulfill the tasks of creating a basemap. This crowdsourcing is only possible due to the excellent task management tool developed by the hotosm, which allows mappers work in a co-ordinated way, and review each others work. Aside from that #MapLesotho wouldn’t be possible without Dave Corley. Because of his tireless work with openstreetmap in Ireland and abroad Dave has the pulling power when we call for help into the openstreetmap community. Was this a success? Well going from barely 25 distinctive mappers to several hundred tells its own story. And on one day two hundred of these arrived to help on the 25th July for the first Mapathon. 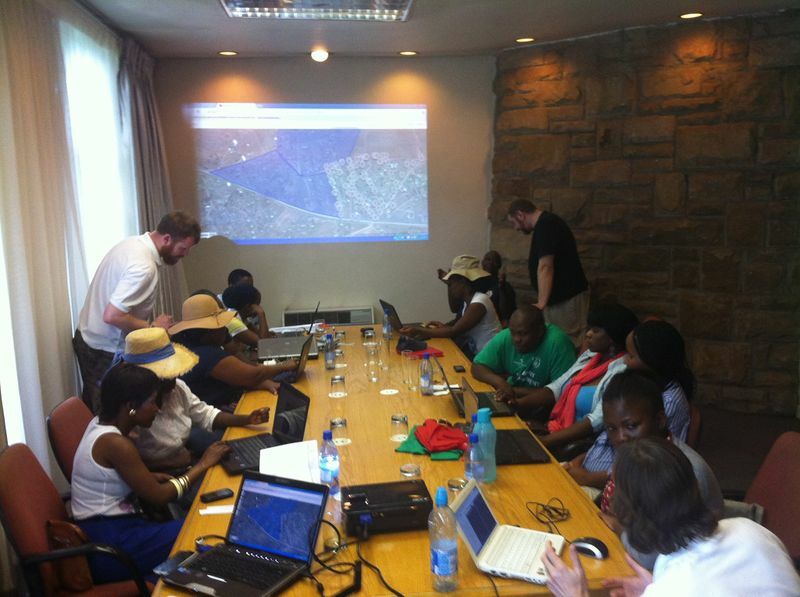 The more that people hear about #MapLesotho the more they want to take part in their own way. 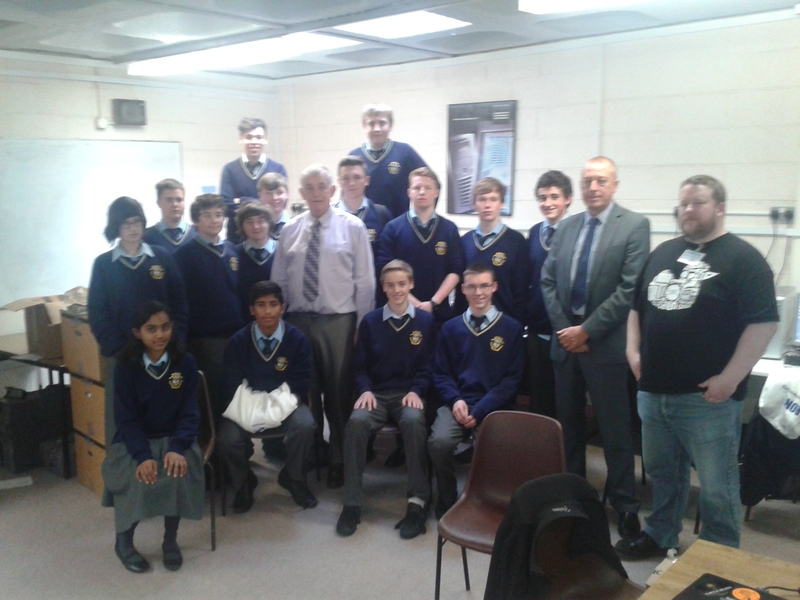 In September Portmarnock Community School (where Action Ireland Trust was born) committed class time of their fourth and fifth year students to mapping Lesotho. The students learned all about how Maths, Geometry, Economics, Geography, Technology, Environment, Science and Civics all collide into one another when you start mapping a country. Overall in 2014 a huge amount of work was done to make the map of Lesotho. This is due, entirely, to the people who stop by, click a tile off the grid and do the mapping. At the time of writing it isn’t finished yet, and new tasks will be devised that build over the existing ones. The progress is visual, so enjoy this speeded up demonstration and have a happy 2015 as you #MapLesotho.